We all know how tough it can be to talk to our close friends or GP about things that worry us or that are causing us embarrassment. If you’ve been experiencing bladder sensitivity, you may have been keeping what you’re going through to yourself. People might not talk about it very often, but one in three women over the age of 18 suffer from bladder sensitivity. By taking care of the symptoms, you can live life to the full again and forget worrying about any little leaks. 1) Experiencing bladder leaks while sneezing or coughing can be worrying and embarrassing. Is it normal? Dr Sarah Jarvis: Millions of British women of all ages experience bladder leaks when they’re dancing, laughing, exercising or just going about their daily lives. Other women get a sudden overwhelming urge to pass water, along with needing to pass water very often, including at night. Others suffer from both sets of symptoms. This condition is known as sensitive bladder, and it’s thought to affect one in every three women between the ages 18 to 75, so you’re certainly not alone. Whatever your symptoms, I’d recommend speaking to your healthcare professional, but there’s no need to feel embarrassed. 2) What advice can you give to those of us who are nervous about discussing the condition with a GP? Dr Sarah Jarvis: Try to remember that your health care professional is there to help you. Write down your questions before your appointment so you know what to ask. Also, consider keeping a diary of your symptoms that you can share with your healthcare professional, as you may uncover a pattern or other information that will be helpful. 3) What can we do to keep sensitive bladder symptoms under control? 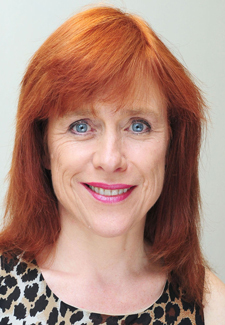 Dr Sarah Jarvis: There are lifestyle changes that may help reduce your symptoms. For instance, many women limit their water intake, but this makes your urine more concentrated, which can be more irritating to the bladder. Keep hydrated! Alcohol can also worsen sensitive bladder whatever the cause. If your symptoms include needing to pass water very often, getting a sudden urge to urinate or getting up at night to pass water, you may find that caffeine, carbonated drinks and cigarettes make your symptoms worse. Try avoiding these if you can and see if your symptoms improve. 4) Are sanitary towels suitable for managing sensitive bladder issues? Dr Sarah Jarvis: No – sanitary products are designed for different fluids so won’t be as effective. Lots of women are struggling needlessly. A recent report from Always Discreet found that due to embarrassment and confusion about the products available, 67% of women are not using a product designed for sensitive bladder, with over half compromising with sanitary pads or frequent changes of clothes. Try specialist products such as Always Discreet for sensitive bladder, which is specifically designed to handle bladder leaks. Always Discreet for sensitive bladder has an entire line up of products that include liners, pads and underwear designed to help meet your bladder control needs. 5) Why do women get bladder leakage after childbirth? Dr Sarah Jarvis: Your body experiences a lot of changes when you’re pregnant and after childbirth, and one thing you may find is your pelvic floor isn’t as strong as it used to be. This means you’re more likely to experience stress incontinence. This means, when there is pressure on the bladder from coughing, sneezing, exercising, laughing, lifting heavy things, and other movements that increase the pressure inside your tummy, leaks can happen. This is the most common type of incontinence in women. Remember, though, that this is totally normal! Stress incontinence can be treated and sometimes cured with pelvic floor exercises to strengthen the muscles that support the bladder. 6) Is it safe to continue to exercise with a sensitive bladder? Dr Sarah Jarvis: Absolutely! Just because you have adult incontinence doesn’t mean you have to stop doing the things you love. Stress incontinence is caused by weakness of the supporting structures of the pelvic floor, and certain exercises and sports can be a trigger for this. Try avoiding high impact sports and ab crunches. Instead, try yoga, brisk walking and stationary cycling. These are all activities that put less pressure on the bladder, which make them good exercise options. To help give you that boost of confidence whilst exercising, try wearing a specialist product such as Always Discreet for sensitive bladder, which will keep you discreetly protected so you can focus on your workout. 7) What can we do to make sure we feel fresh all day, every day, and avoid worries about smell and leaks? Dr Sarah Jarvis: The best way to control odour from leaks is through prevention. Along with exercise, appropriate lifestyle changes or medical treatment, Always Discreet is a new line of products from Always, now designed specifically for your sensitive bladder. This new line of products includes liners, pads and underwear specially designed to help meet your bladder control needs, from those small little leaks to heavier leaks. New Always Discreet also absorbs leaks and odours in seconds and has a unique Advance Core Technology to help lock away wetness for hours. Its exclusive OdourLock™ technology neutralises odours instantly and continuously.